Objective: Peer reviewed data is often published by single centers that are affiliated with teaching institutions with a high volume of cases. As operations grow in popularity, they are performed at a wide variety of institutions with the potential to produce inconsistent results. 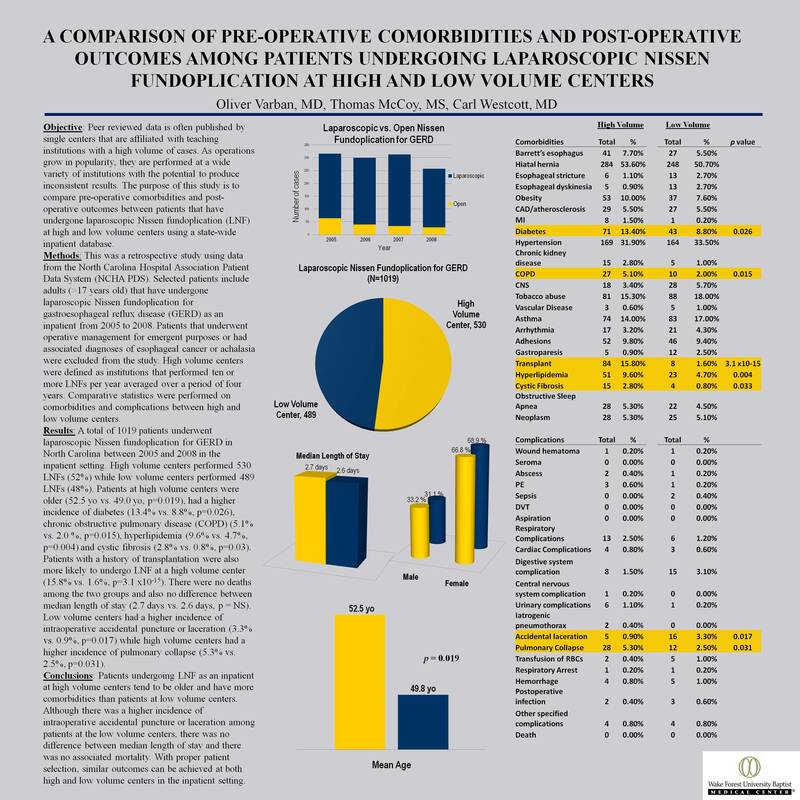 The purpose of this study is to compare pre-operative comorbidities and post-operative outcomes between patients that have undergone laparoscopic Nissen fundoplication (LNF) at high and low volume centers across North Carolina. Methods: This is a retrospective study using the North Carolina Hospital Association Patient Data System database. Selected patients include adults (>17 years old) that have undergone laparoscopic Nissen fundoplication for gastroesophageal reflux disease (GERD). Patients that underwent operative management for emergent purposes, or had associated diagnoses of esophageal cancer or achalasia were excluded from the study. High volume centers are defined as institutions that performed ten or more LNFs per year averaged over a period of four years. Comparative statistics are performed on a number of variables between high and low volume centers. Results: A total of 1019 patients underwent laparoscopic Nissen fundoplication for GERD in North Carolina between 2004 and 2008. High volume centers performed 530 LNFs (52%) while low volume centers performed 489 LNFs (48%). Patients at high volume centers were older (52.5 yo vs. 49.0 yo, p=0.019), had a higher incidence of diabetes (13.4% vs. 8.8%, p=0.026), chronic obstructive pulmonary disease (5.1% vs. 2 %, p=0.015), hyperlipidemia (9.6% vs. 4.7%, p=0.004) and cystic fibrosis (2.8% vs 0.8%, p=0.03). Patients with a history of transplantation were also more likely to undergo LNF at a high volume center (15.8% vs. 1.6%, p=3.1 x10-15). There were no deaths among the two groups and also no difference between median length of stay (2 days). Low volume centers had a higher incidence of intraoperative accidental puncture or laceration (3.3% vs. 0.9%, p=0.017) while high volume centers had a higher incidence of pulmonary collapse (5.3% vs 2.5%, p=0.031). Conclusions: Patients undergoing LNF at high volume centers tend to be older and have more comorbidities than patients at low volume centers. Although there was a higher incidence of intraoperative accidental puncture or laceration among patients at the low volume centers, there was no difference between median length of stay and there was no associated mortality. Although patient selection and complications are different, overall outcomes are the same at high and low volume centers.